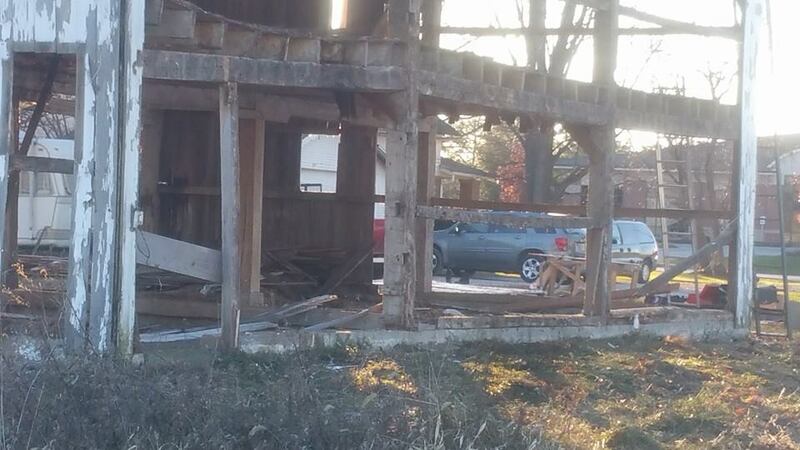 Many people have contacted us about the Southport Barn. 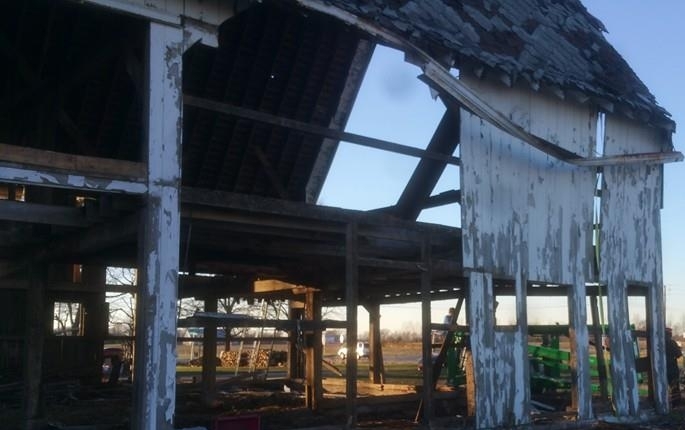 Many have a memory to share or a story to tell about the memories they have of this 95 year old barn. Please feel free to go to our blog and share your stories with us and others. We would love to hear them. A gambrel or gambrel roof is a usually symmetrical two-sided roof with two slopes on each side. The upper slope is positioned at a shallow angle, while the lower slope is steep. This design provides the advantages of a sloped roof while maximizing headroom inside the building's upper level and shortening what would otherwise be a tall roof. The name comes from the Medieval Latin word gamba, meaning horse's hock or leg. The term gambrel is of American origin, the older, European name being a curb (kerb, kirb) roof. Europeans historically did not distinguish between a gambrel roof and a mansard roof but called both types a mansard. In the U.S.A., various shapes of gambrel roofs are sometimes called Dutch gambrel or Dutch Colonial gambrel with bell-cast eaves, Swedish ~, German ~, English ~ , French ~, or New England gambrel. The cross-section of a gambrel roof is similar to that of a mansard roof, but a gambrel has vertical gable ends instead of being hipped at the four corners of the building. A gambrel roof overhangs the façade, whereas a mansard normally does not. 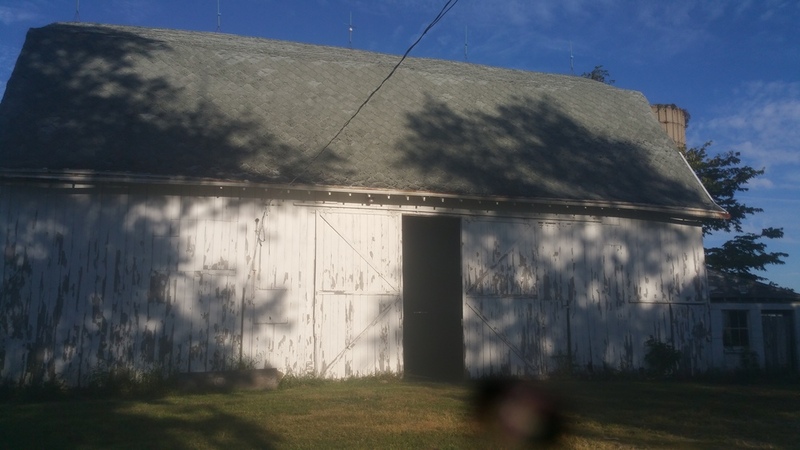 Older barns, were usually built from lumber sawed from timber on the farm. 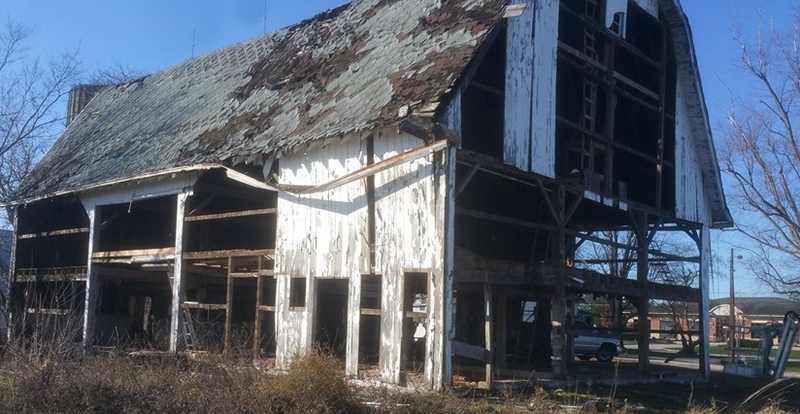 Prior to the 1900s, most barns were timber framed (also known as post and beam) forming very strong structures to withstand storms and heavy loads of animal feed. From about 1900 to 1940, many large dairy barns were built in northern USA. These commonly have gambrel, or hip roofs to maximize the size of the hayloft above the dairy roof, and have become associated in the popular image of a dairy farm. The advancements in dairy farming in the early 1900's would greatly increase efficiency and production and a new era of dairy barns were designed to offer the cow maximum comfort and the farmer many time saving conveniences. While the manure handling and the milking equipment made some advancements since early 1900's many small dairy farms still milk their herds in barns configured nearly one hundred years ago. By the turn of the century there were many types of dairy barns, with many modifications of each type. But in the early 1900's the plank frame barn, in one form or another, became the most popular. 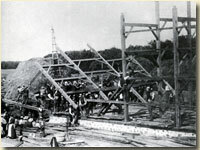 The main reasons for the building of the plank frame barn were. - The fact that it saves in cost of lumber. - It provides far more storage room in the hayloft. - Less labor intensive to build than any other type. Another big advantage to the new construction methods the Plank Frame barn offered over Mortise and Tenon was the new open style greatly aided use of modern hay carrying machinery. While hay carriers were used in Mortise and Tenon barns It was much easier and less labor intensive in barns with open centers. 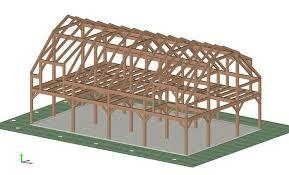 In the plank frame barn there are neither crossbeams nor heavy supporting timbers to interfere with unloading of hay. 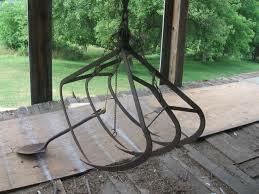 The hay carrier was, perhaps, the first important laborsaving device invented for use in the barn. It made possible the storage of large quantities of hay in the barn and has introduced more economical types of construction for hay storage. At the turn of the century no large modern barn is complete without one. The scarcity of labor during the haying season and the increased value of hay made it imperative that every means available to facilitate the handling and the saving of the hay crop. The original hay carrier was operated on a wooden track. The steel track, of which there are many forms on the market, makes the carrier much easier to operate, and is greatly superior to the wooden one. Simplicity, durability, and strength are three important factors to consider in the selection of a hay carrier. It needed be simple, to be easily understood and operated. It also needed to be durable and strong enough to support the loads. Breakage during the haying season could easily cause a partial or a complete loss of the hay crop. Yep, we actually take the barns down one board at a time. Our hope is to cause as little damage as possible. We scale beams, rent lifts, and use any tool that will make the process easier. Our crew is small, but we are mighty. We take barns down in trade for their lumber. 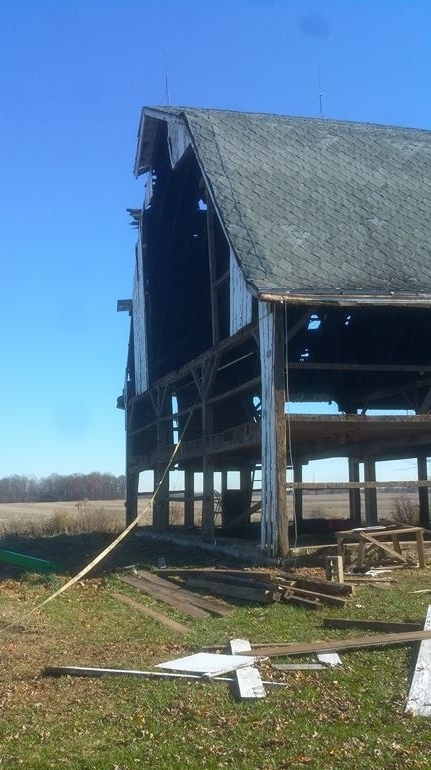 Some are thrilled to find someone that will take down a barn for them and move it off their site. Others, understandably so, would like a return on their barn. We just aren't at that stage in the game yet. If we ever get there, we will let everyone know. After the reclaimed lumber is down we take it back to our shop. There we de-nail it, clean it up, trim off the unusable parts and prepare it for sale. It is easy to say, but it is actually a great deal of work. The idea that the lumber that we reclaim will now create new memories for families that want to create that rustic look in their home, a new look for customers sitting by a clad wall in a restaurant, or a designer's vision when building a new home is amazing to us.